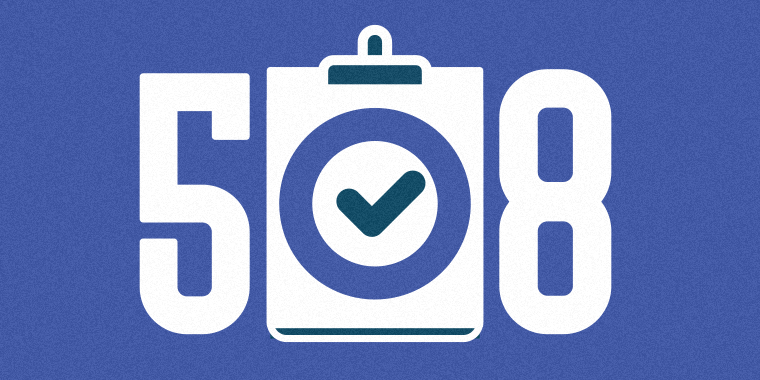 What Is 508 Compliance for E-Learning and How Can You Achieve It? Imagine that you are hearing-impaired and have to take an e-learning course for work. Then, when you open the course up, you find it contains several audio clips and no transcripts. How, then, are you supposed to complete the course? Section 508 compliance is all about accessibility, ensuring that everyone—regardless of abilities—can benefit from e-learning. Let’s dive a little deeper to learn more about Section 508, why it’s important, and how you can achieve it with Articulate Storyline 2. 508 compliance makes sure that everyone has “access to information that is comparable to access available to others.” The standards for compliance were set by Section 508 of the Rehabilitation Act of 1973 and require federal agencies to provide software and website accessibility to people with disabilities. Making your e-learning accessible and 508 compliant means that you’re enabling employees with disabilities to receive the same access to the training materials used by their peers. This need has given rise to software optimized to meet 508 requirements, like Storyline 2, which is compatible with assistive technology. Why Is 508 Compliance Important? All federal agencies and institutions that receive federal funding are required to be 508 compliant. This means that government agencies, federal-funded nonprofits, public higher education institutions, and public K-12 schools must use software and web tools (including e-learning) that are accessible to people who have disabilities and may use supporting tools such as screen readers. And this doesn’t just go for the public sector. Many large private companies are 508 compliant, including ones that create accessibility software, like Microsoft. As an e-learning developer, it’s likely that at some point in your career you’ll be asked to create e-learning that complies with these guidelines. How Can You Make Your E-Learning 508 Compliant? As you might imagine, the checklist for 508 compliance is pretty lengthy. Thankfully, e-learning tools like Storyline 2 make it easy to ensure that your courses are optimized to meet requirements. For example, one of the most important features of a 508-compliant course is its compatibility with screen readers. With Storyline 2, you can enable Alt Text, which means you can customize how each slide object is described via a screen reader. Storyline 2 also allows you to specify the order in which the user’s keyboard navigates and screen reader reads slide objects. This customization is crucial because, by default, screen readers announce each object on the slide according to its name in the timeline panel, which can easily cause confusion when you have multiple, similarly named objects. For a step-by-step explanation of how to modify what screen readers announce, check out this helpful how-to. Screen reader integration is just one way Storyline 2 helps you create more accessible e-learning that’s 508 compliant. For a complete list of Storyline 2’s accessibility support, click here. For more information and additional resources, see this article. Eager to learn more? Check out our awesome and helpful e-book, 6 Best Practices for Designing Accessible E-Learning. Then jump into a discussion about accessibility and find out what other e-learning pros are doing to achieve 508 compliance by visiting the Building Better Courses forum or reading this insightful article. Is screen reader capability coming to Rise soon? If so, can you give me a ballpark date?